A new analysis conducted by Aidspan shows that domestic contributions by low- and lower-middle income countries to their HIV, TB and malaria responses accounted for 16% for HIV, 36% for TB, and 36% for malaria, for the 2015-2017 period. Countries will experience huge gaps in funding for the 2018-2020 period unless domestic and international commitments increase. The analysis, which aimed to assess the domestic contributions to the health sector and to the three disease programs, focused on 13 ‘high-impact’ African countries, as classified by the Global Fund. The countries each have a high burden of one, two or all of the three diseases. Investments in these 13 countries account for nearly half of the Global Fund investments for the 2017-2019 funding cycle. Countries are a mix of low, lower-middle and upper-middle income countries, as classified by the World Bank. Data for this analysis came from three databases – the World Health Organization (WHO), the World Bank, and the Global Fund - as well as from grant application documents, particularly the funding landscape submitted to the Global Fund by the sampled countries. The funding landscape reports disease-specific expenditures for the period 2015-2017, total funding needs, and anticipated funding for 2018-2020. Funding landscapes information was available for 11 of the 13 countries, except for Ghana and South Africa. In fact, obtaining data for this analysis was difficult and for some segments of the analysis, some countries were dropped because of incomplete data. Funds for national health expenditures come from three main sources: general government revenues, external sources (via governments or NGOs), and households (out-of-pocket payments, or OOP). Governments that prioritize the health sector are more likely to allocate more resources to it. Prioritization is reflected in the proportion of the general government expenditure directed towards the health sector. The 13 countries spent an average of 7.4% of government expenditure on health. The proportion ranged from 1.22% in Mozambique to 18.1% in Sudan. Thus, all but one – Sudan – failed to meet the minimum target of 15% agreed on by the African Union Heads of States in the Abuja Declaration. The WHO separates health expenditures into ‘current’ (e.g. expenditures for remuneration of personnel, rent payment, purchase of medications, reagents, and other health commodities) and ‘capital’ (e.g. funds for building construction, equipment). In our sample, the proportion of current health expenditures funded by government revenues ranged from 8% in Mozambique to 54% in South Africa in 2015. In contrast, funding from external sources was highest in Mozambique (85%) then Uganda (40%) and lowest in South Africa (2%) and Sudan (2%). It is clear that external funding remains vital to the health sector in most low-income countries. The third source of health funding, OOP expenditures, was extremely high in Nigeria (72%) and Sudan (63%), far more than the global average (18.1%) and sub-Saharan average (36.25%), in 2017. High OOP payments acted as barriers to access to health services and are often associated with catastrophic and impoverishing spending. About $8.2 billion was available to finance the HIV national strategic plans from all sources in the 2015-2017 period, based on data reported by nine countries; Uganda, and Nigeria did not have available data so are excluded from this analysis. Of this amount, only $1.3 billion, about 16%, came from domestic sources. This average percentage conceals wide discrepancies: Mozambique covered 3% domestically, both DRC and Zimbabwe 4%, while Sudan reported the highest domestic contribution at 23% of their total HIV funding. The Global Fund accounted for 24% of the total funding for HIV while other donors together accounted for 60%. Global Fund contributions to HIV expenditures were highest in Sudan (68%) and lowest in Zambia (15%). In eight of these countries excluding Sudan, these lower Global Fund proportions may be related to the presence of the U.S. President’s Emergency Plan for AIDS Relief (PEPFAR), one of the largest sources of HIV financing alongside the Global Fund. Kenya did not report funding from external sources for 2015 and 2016. Approximately $385 million was available from all sources to finance the TB national strategic plans for the 2015-2017 period, based on data reported by six countries: Cote d'Ivoire, DRC, Kenya, Mozambique, Sudan and Zimbabwe. Of this amount, $137 million (36%) was from domestic resources. Domestic contributions, as a percentage of the total funding, were lowest in DRC (0%) and highest in Zimbabwe (53%). The Global Fund was the single largest source of TB funding for these six countries and accounted for 48% of the available funding. Global Fund’s contributions ranged from 33% in Zimbabwe to 88% in DRC. Ethiopia, Uganda, Tanzania and Zambia did not report Global Fund spending for the 2015-2017 period and therefore were excluded from this analysis. 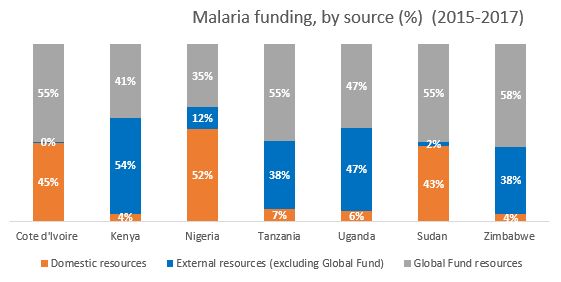 Based on data reported by seven countries, excluding DRC, Ethiopia, Mozambique and Zambia, $3.6 billion was available for malaria in the same time period. Of this total amount, $1.3 billion (36%) was from domestic resources. However, this amount is strongly influenced by Nigeria which accounts for 70% of the total domestic resources for malaria. Domestic contributions were below 10% in four of the seven countries – Kenya (4%), Zimbabwe (4%), Uganda (6%) and Tanzania (7%) – and above 40% in the remaining countries – Sudan (43%), Cote d'Ivoire (45%) and Nigeria (52%). Global Fund contributions ranged from 26% (Kenya) to 58% (Zimbabwe). The sampled countries will require in total $15 billion, $1 billion and $6 billion for the 2018-2020 period to fully fund the HIV, TB and malaria national strategic plans, respectively (see Table 1, below). Estimated available funding from all sources – domestic and international – reported by the countries, amounts to $11 billion (HIV), $708 million (TB) and $3 billion (malaria) creating a funding gap of 24% (HIV), 49% (TB) and 44% (malaria). Figure 5 shows HIV resource availability and total resource needs for individual countries. Increased domestic and international donors commitments are required to close the funding gaps. Note: For grants denominated in euros, a conversion rate of 1 euro = 1.1675 US dollars was used. Domestic contributions remain largely unchanged in the current allocation period (2018-2020) when compared to the previous (2015-2017). Of the total estimated available funding for the period 2018-2020, domestic contributions account for 16% (vs. 8% for 2015-2017) for HIV, 26% (vs. 32%) for TB and 39% (vs. 37%) for malaria. Proportions may change as more funding becomes available. Significant funding gaps are expected in the 2018-2020 period if domestic and international resources remain at their current levels. International sources such as the Global Fund are less likely to fill these gaps; in fact, international assistance is on the decline – HIV assistance diminished by more than 20% between 2013 and 2016 according to the International AIDS Society-Lancet commission (see GFO 339’s article on Peter Sands’ call for more funding from implementing countries). The onus, therefore, is on the implementing countries to increase their share of funding their disease responses. Countries can raise additional health financing by increasing tax revenues, budgetary reallocation (from low-priority expenditures) and debt relief (which frees up additional domestic resources that can be invested in health). All these depend on political will, hence the need for increased advocacy at the country and regional levels (such as through the African Union). Countries also need to ensure that available resources are utilised optimally, including using savings from increased efficiencies to help reduce the gaps. Tracking financing to HIV, TB and malaria programs is difficult due to the lack of accurate, complete and timely data available. Countries have taken strides to improve the quality of health financing data, such as the NHAs and disease-specific efforts such as the NASAs. More needs to be done to improve the frequency and outputs of these existing tools. Accurate and timely data is necessary to monitor and track health financing and its efficiency. The funding landscape documents are part of a downloadable package of grant application (funding request) documents available on the Global Fund website. To access the documents, visit the Global Fund website at https://www.theglobalfund.org/en/. Under the ‘Where We invest’ page, click on the country of interest to access the individual country pages. The application documents are available at the bottom of the Country Overview page. Aidspan will publish a follow-up GFO article in September 2018 assessing how implementing countries intend to address these funding gaps for the 2018-2020 period and beyond.